How do I schedule staff? To schedule staff, you need to add employees to shifts. Navigate to the shift in any of the calendar views. Click on the shift to open the Shift Edit Screen. 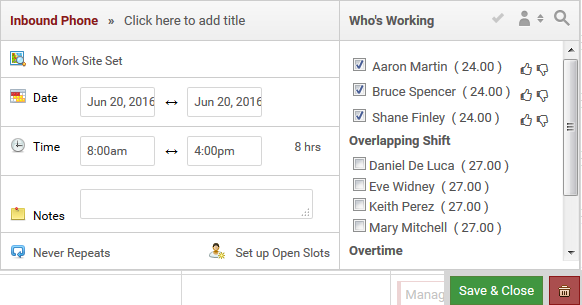 On the Shift Edit Screen, click the names of the employees who will work for that shift. The Employee's list will clearly show who is Available, Overbooked or on Overtime. Within the Shift Edit Screen, you can also add a new employee by simply clicking on the option 'New Employee' at the bottom of the employee's list. When you have finished choosing your employees click the 'Save & Close' button on the bottom right to save your changes.